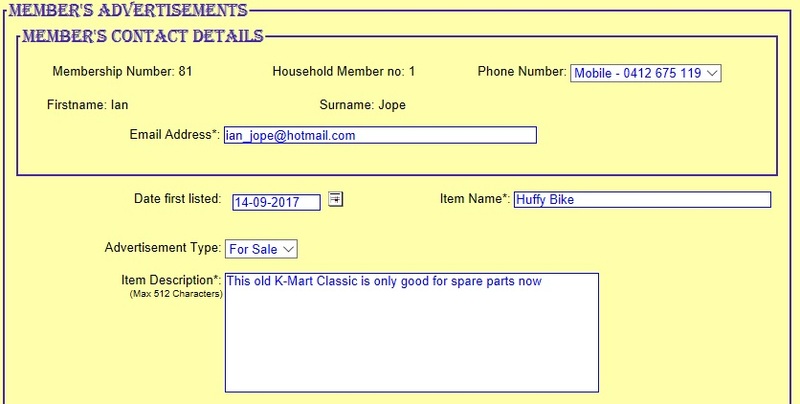 Introduction: This is where you can advertise your bicycle gear for sale (Including uploading photos) or put a request for something you want to buy. 2) Click on the Members Profile TAB. See Figure 1 below. 3) In the "Manage my Advertisements" at the bottom of this page, press the Manage Advertisements button. See Figure 2. 4) You will get the main menu as shown in figure 4. As you can see from this example you have already advertised one item. If you want to make changes or remove the item you will need to select the button just to the left of the name. As there is only one item it is selected as default. Press the Update or Delete button accordingly. If you want to create a new advertisement, then press the Add button. See Figure 3. 5) Your name and contact information will appear as a default. You can change the contact phone number or e-mail address as needed. Fill in the details such as date listed, the item name, the advertisement type (For Sale or Wanted) and the item description. See figure 4. 6) Now select any photos you want to go with the advertisement. You can upload up to 6 photos by pressing the Browse button. If there are no photos uploaded (Such as creating a new advertisement for the first time) your display will look as shown in Figure 5. Note that Photo 1 will be the thumbnail picture that is displayed in the advertisements ares for everyone to see so it is highly recommended. If you are updating an existing Advertisement, it will show any photos already uploaded as shown in Figure 6. 8) If you delete an Advertisement, you will get a confirmation screen like the one shown in Figure 7. Press the Delete button to remove the advertisement or Cancel button to leave advertisement on website.